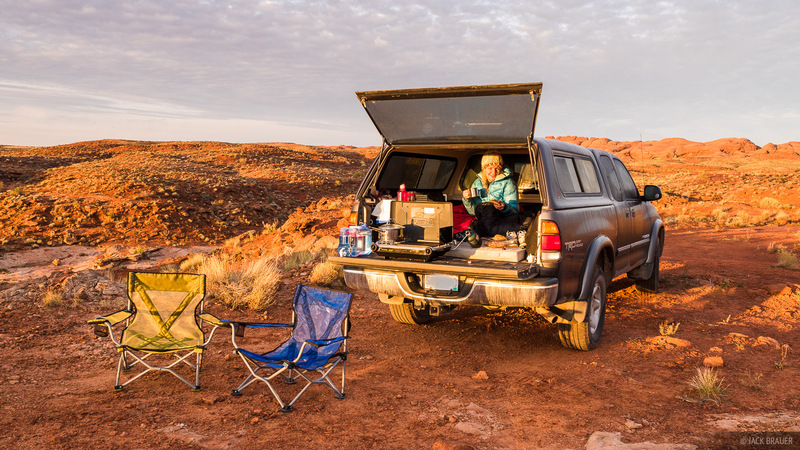 In late October/early November we headed out to Utah for a two-week road trip of car camping, hiking, and backpacking in the deserts of southern Utah. 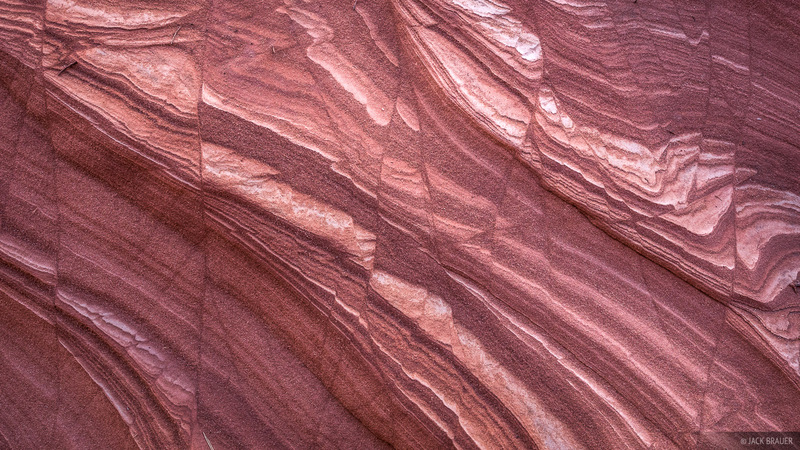 We basically drove a big counter-clockwise loop starting from Green River, heading southwards to Capitol Reef, southeast to Dark Canyon kind of near the north end of Lake Powell, to Natural Bridges National Monument, and finally to Cedar Mesa. Here are my favorite photos from the trip, arranged in roughly chronological order. Morning coffee in the desert. 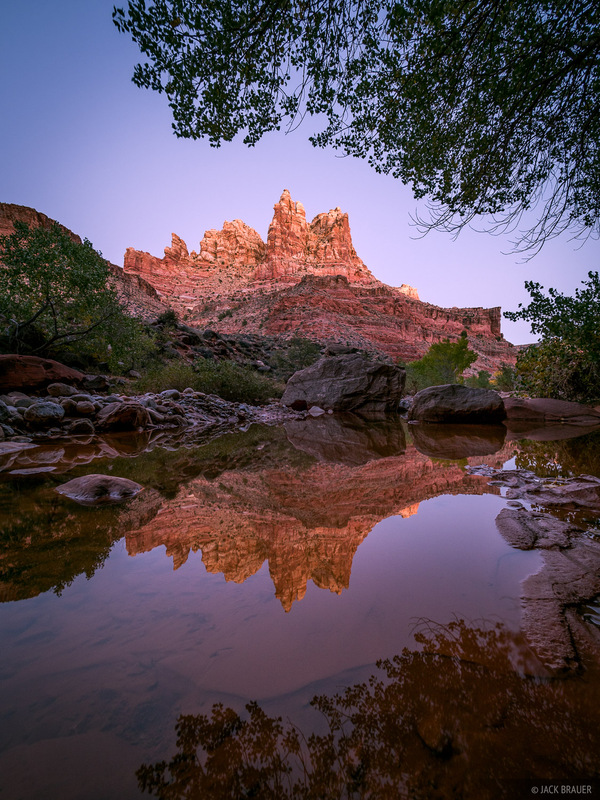 Our first destination was the remote and relatively seldom-visited region along the Green River between the towns of Green River and Hanksville. 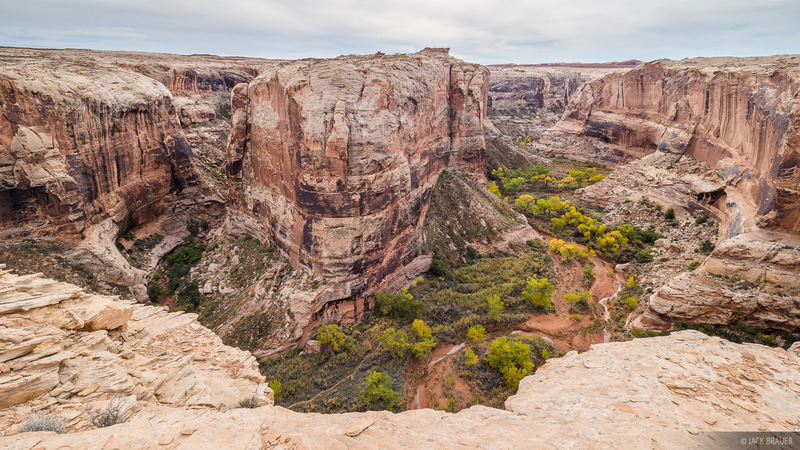 A panoramic view above a big circular bend in the Green River. Looking down into Three Canyon from the rim. We tried to backpack into Three Canyon, but the hiker’s route into the mouth of the canyon involved a slightly-too-sketchy crossing over steep slickrock directly above the Green River, so we decided to throw in the towel and settled for this view from the rim instead. 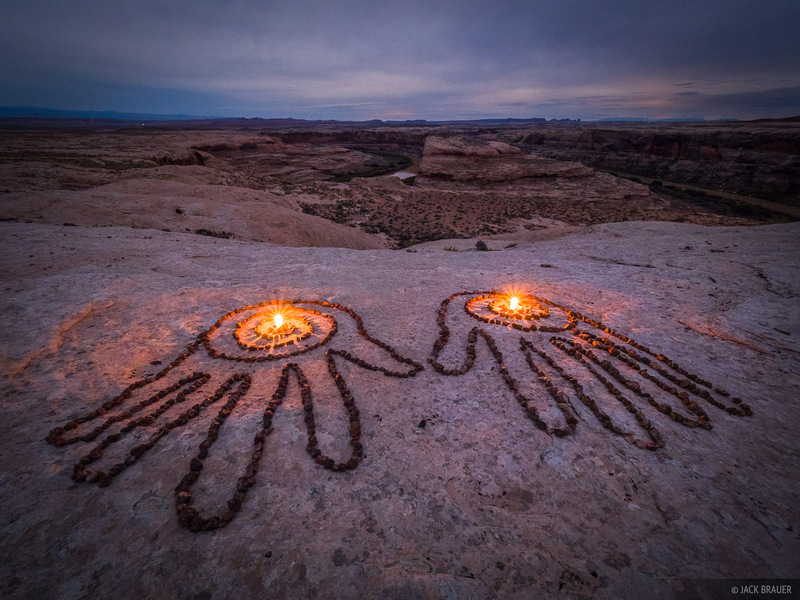 Somebody had some fun making these trippy hands on the slickrock; I had fun photographing their “qi”! We attempted a nearby slot canyon but didn't get very far; it proved to be a bit too scrambly for our tastes without ropes. 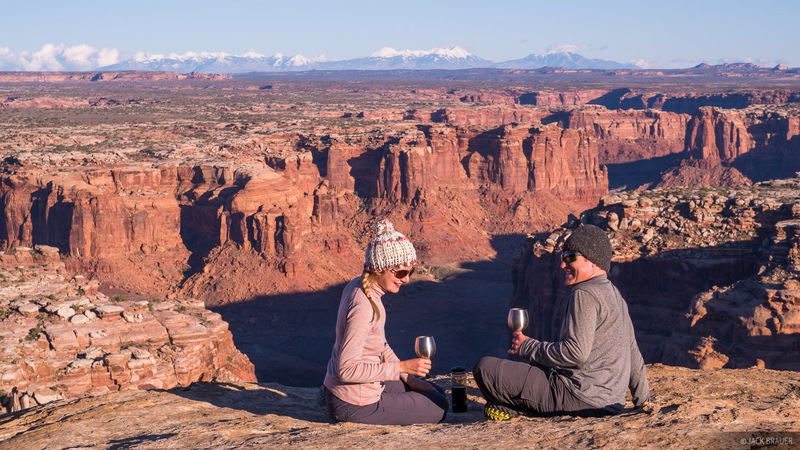 Wine time in the canyonlands. Pardon the uber-cheese-factor here; but I just can’t resist! 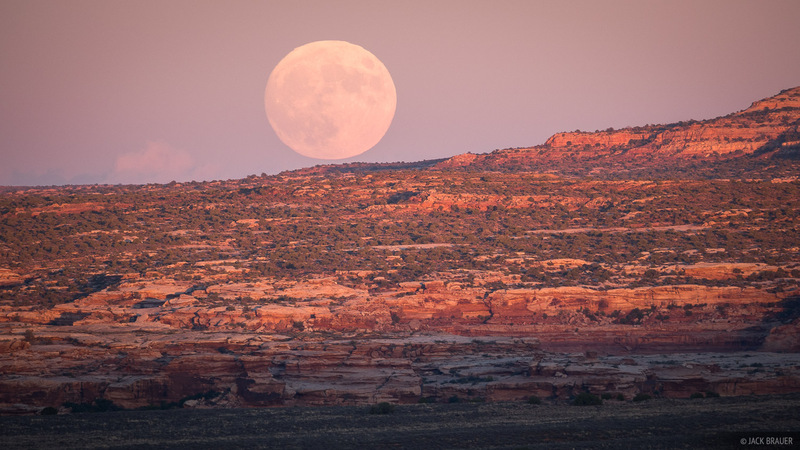 A full moon rises over the desert. 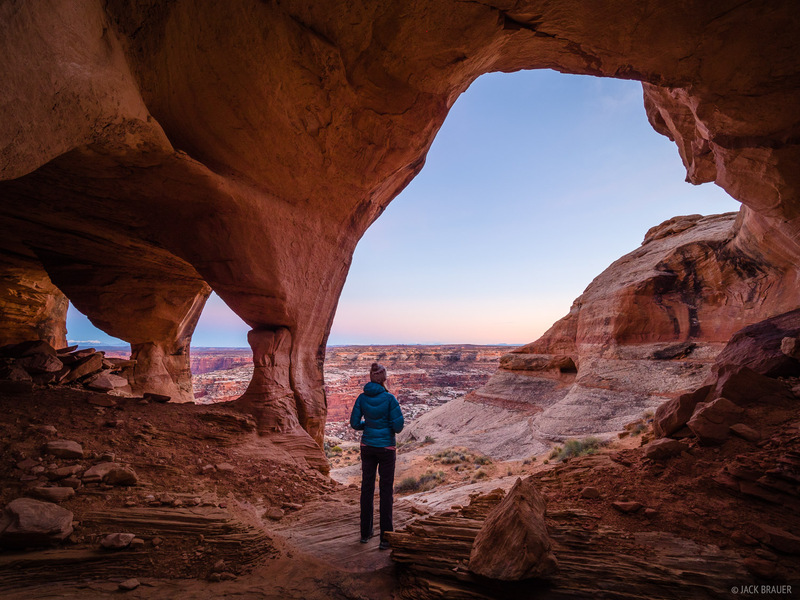 We also made a short backpacking trip to a remote but spectacular set of arches and alcoves. Fantastic! 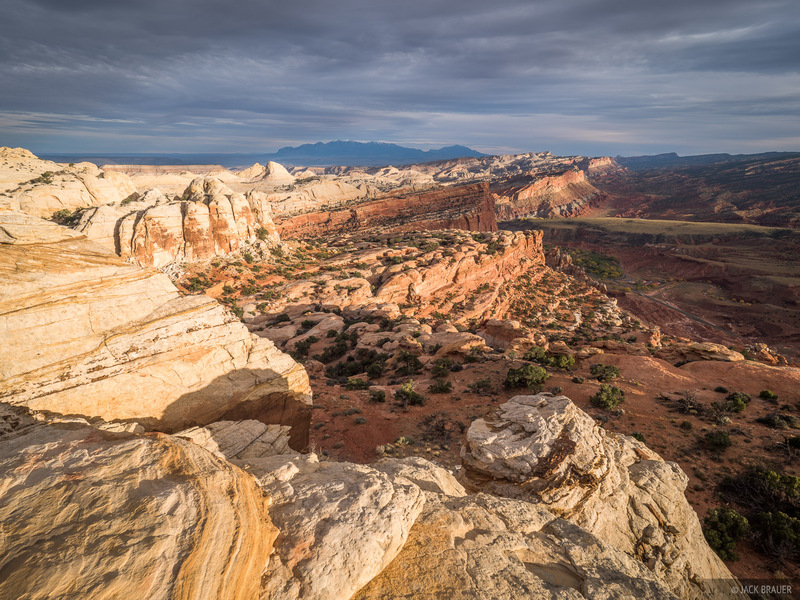 The Waterpocket Fold as seen from Navajo Knobs, with the Henry Mountains in the background — Capitol Reef National Park, Utah. From the Green River area we headed to Capitol Reef National Park, where we did a wonderful evening hike to Navajo Knobs. From Capitol Reef we headed down past the north end of Lake Powell and over to Dark Canyon, where we spent two nights backpacking and hiking up and down the canyon. It’s been over 16 years since I’ve visited this canyon and it’s as spectacular as I remember, kind of like a mini Grand Canyon. Sipapu Bridge spans the White Canyon. With a height of 220 feet and length of 225 feet, Sipapu Bridge is the second longest natural bridge in the world (after Rainbow Bridge) and the seventh longest arch if you consider it an arch. 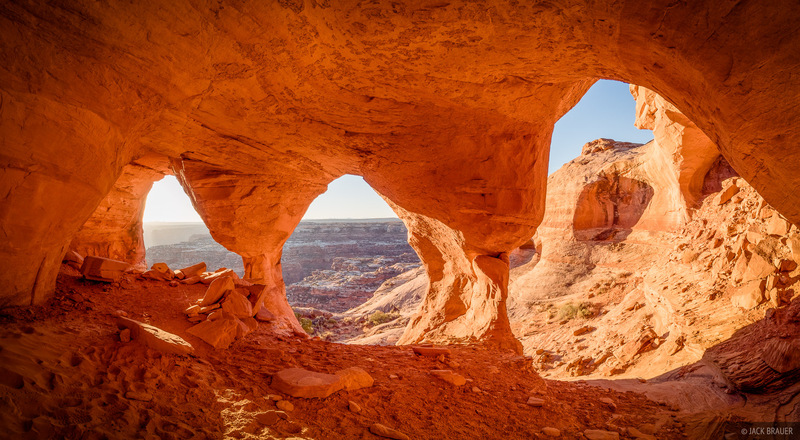 A natural bridge is formed by erosion from a creek or river that eventually runs underneath it, while arches are formed by erosion from seepage, sand, and/or wind. *Full disclosure: Utilizing my official artistic license, I have taken the liberty of photoshopping out some metal handrails that exist to help people walk down the steep slickrock here. After all these years of exploring the deserts and canyons of Utah, I never bothered to go to Natural Bridges National Monument. It’s pretty much out of the way from anywhere and after all, it’s just another couple arches, right? 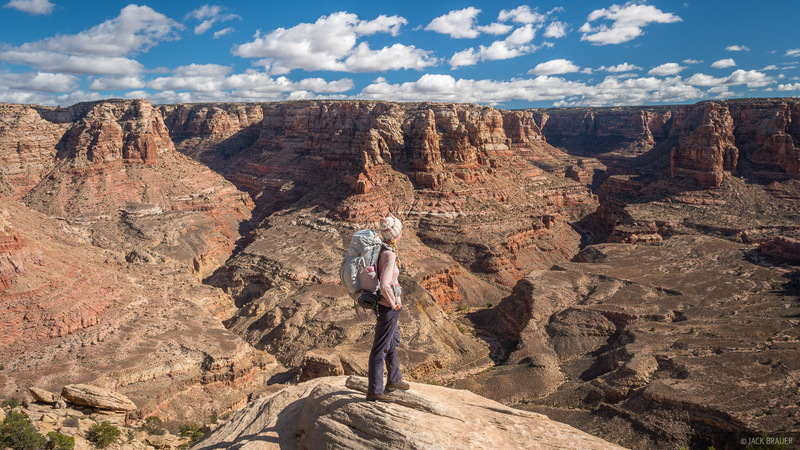 Well, on our recent road trip after backpacking in nearby Dark Canyon, Natural Bridges was finally on our way, so I figured we might as well stop and check it out. And we were blown away. 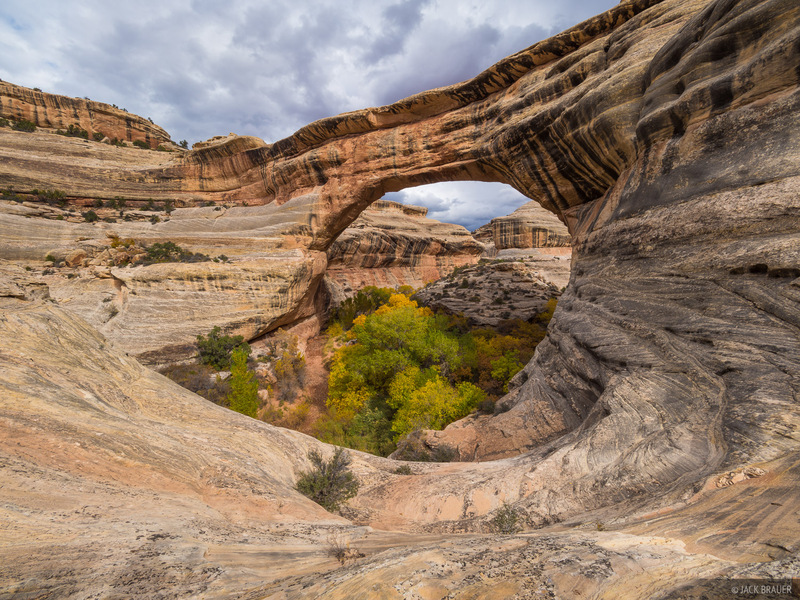 First off, the natural bridges — particularly Sipapu — are absolutely mind-boggling. These aren’t some dainty little arches; these are ginormous masses of earth soaring through the sky over the canyon. And what a canyon too! 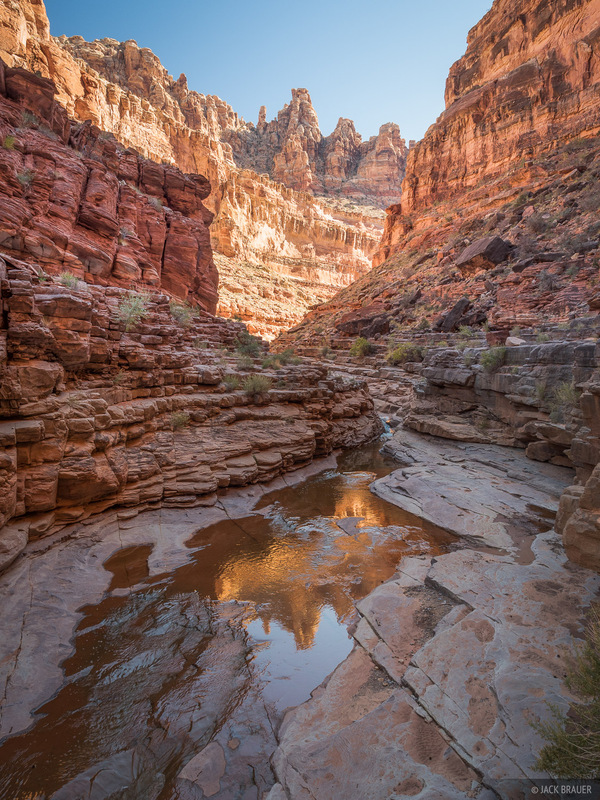 Even if the bridges weren’t there, White Canyon would still be an awesome place for a hike. 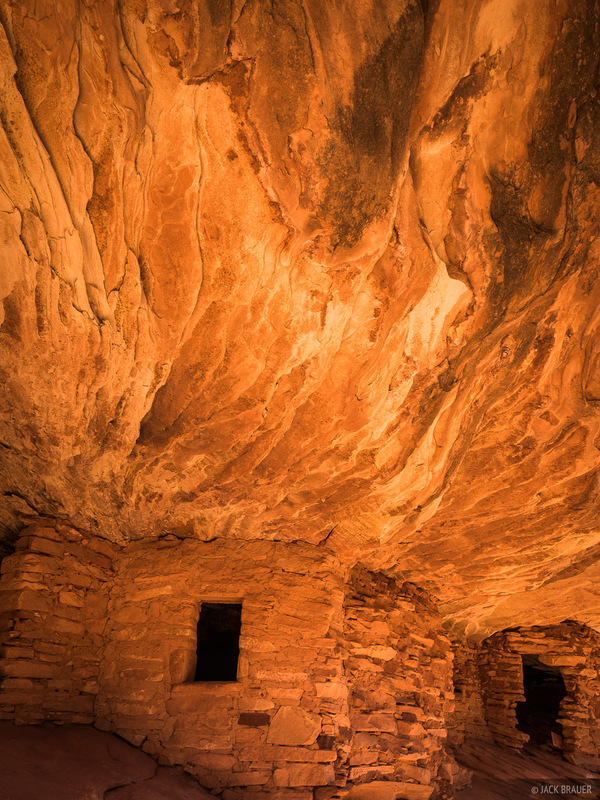 And if that’s not enough, there’s an abundance of Ancestral Puebloan ruins throughout the canyon — including some of the most fascinating sites I’ve yet seen. 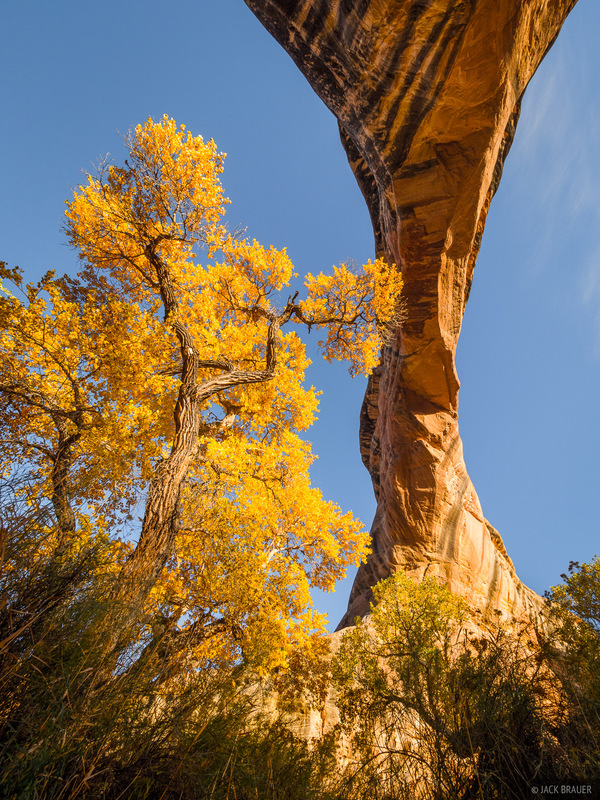 Sipapu Bridge soars directly overhead, high above a cottonwood tree with autumn colors. The thing about Natural Bridges Monument, though, is that there’s not a whole lot to see from the road. A roadside tourist might not see what’s so great about this place. You’ve got to at least hike down to Sipapu to see the glory. On our first day there we hiked the entire “three bridge” loop hike starting and ending at the Sipapu trailhead. We enjoyed the canyon so much we decided to spend a second day there hiking up-canyon to see more of it! 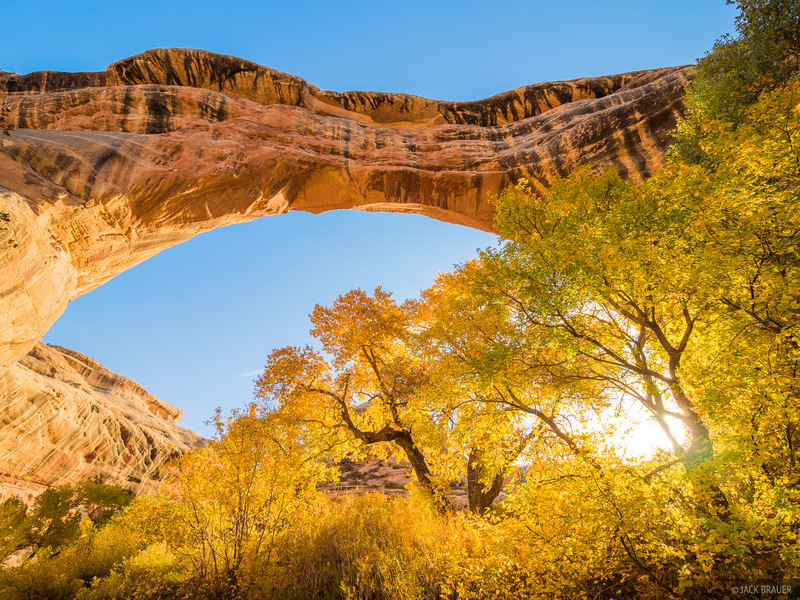 Sipapu Bridge soars over some autumn colored cottonwood trees in White Canyon. 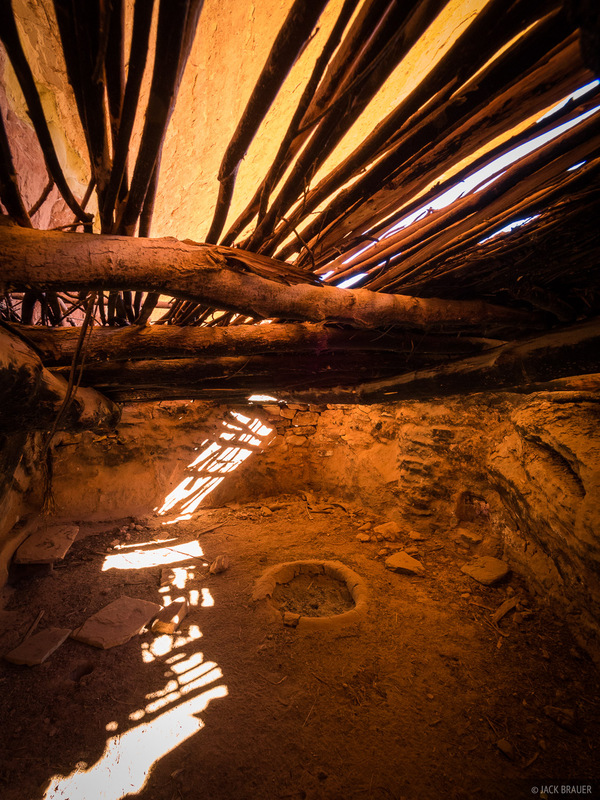 A look inside an Ancestral Puebloan kiva with a still-intact roof after approximately 1000-700 years. * Please note that I did NOT enter this kiva, which would be a foolish thing to do and could possibly damage the ancient structure. I carefully pointed my camera through a gap below the roof, and my ultra-wide lens makes it look like a view from inside. 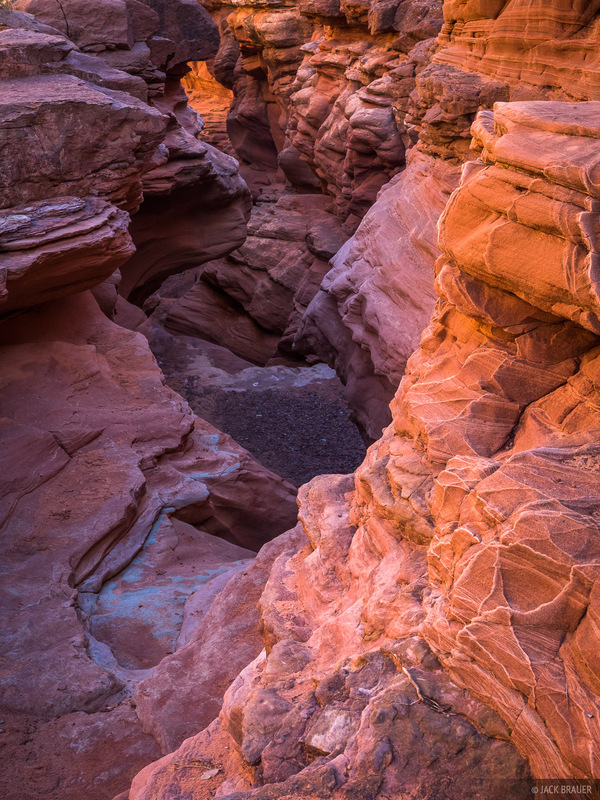 Horse collar ruins are located between Sipapu and Kachina bridges, up on a hard-to-get-to ledge as usual. It’s so fascinating to image people living here almost a thousand years ago, and the fact that these ruins have been sitting here for that long gives them an aura of sacredness. 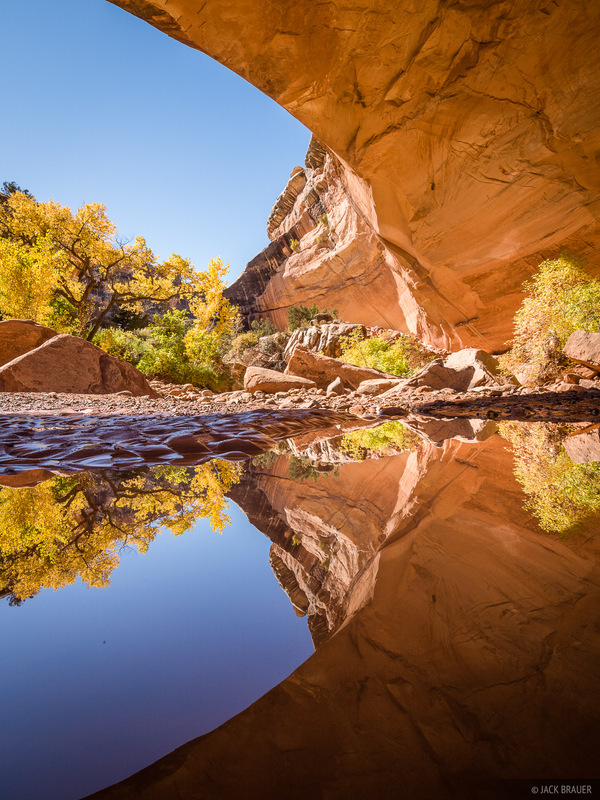 A reflection under Kachina Bridge. 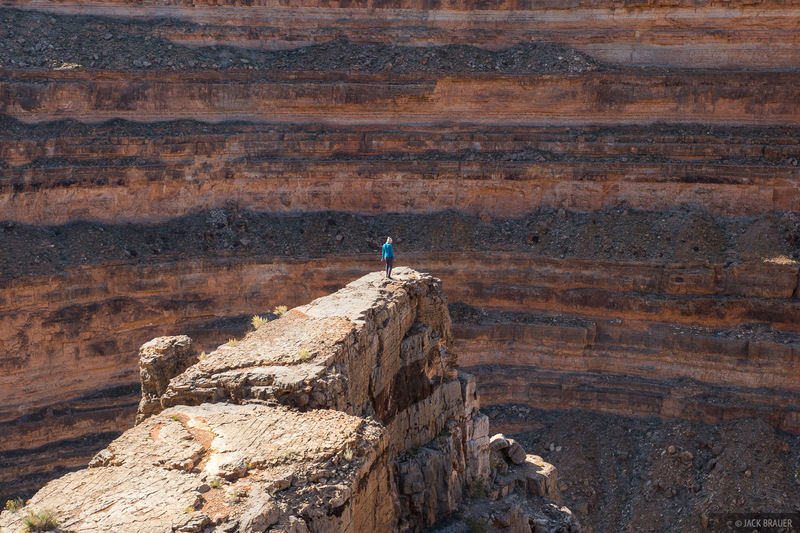 Kachina Bridge, though not as high or long as Sipapu, is even more massive in girth — 93 feet thick! 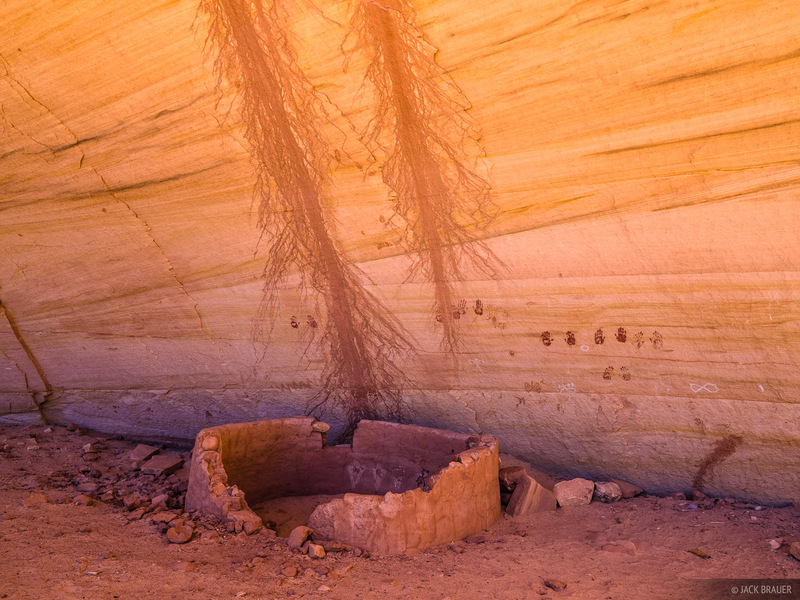 An Ancestral Puebloan ruin and handprints in White Canyon. 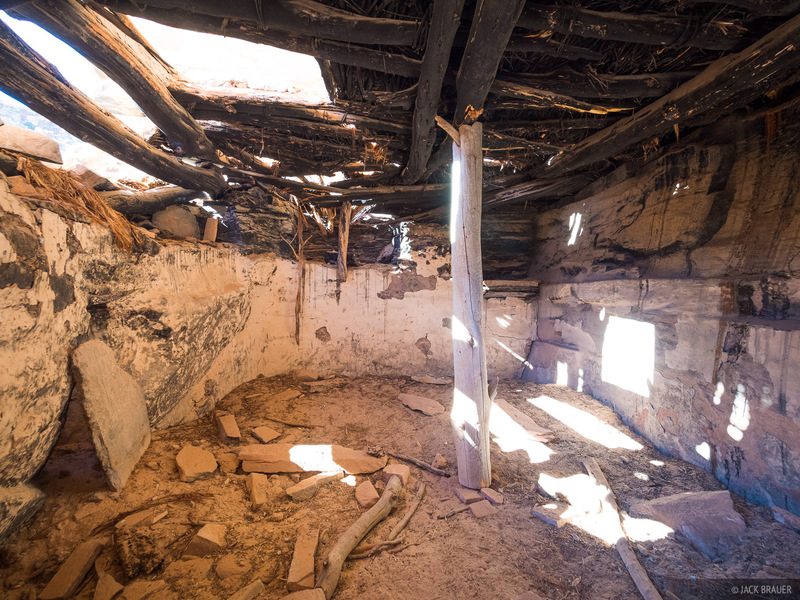 An Ancestral Puebloan ruin in White Canyon. 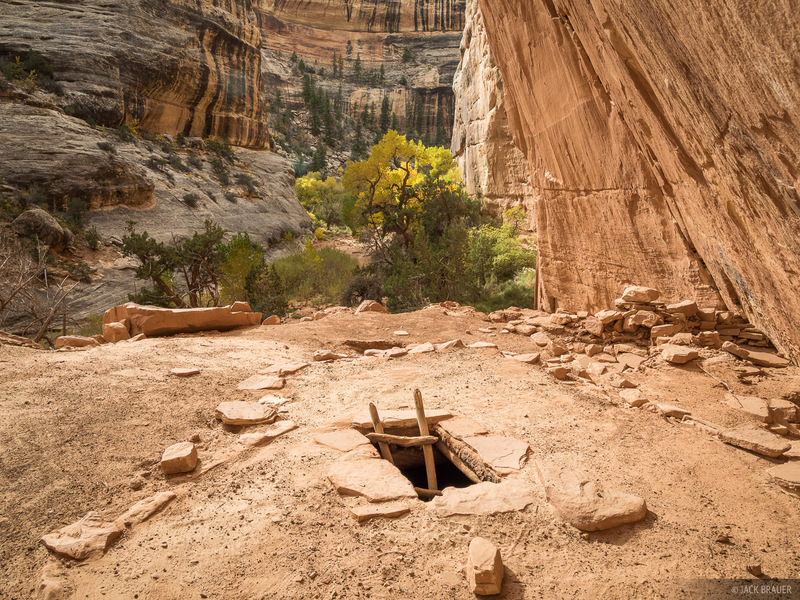 Ancient Puebloan ruins are often found under deep alcoves on high and/or difficult to access ledges above the canyon floors, likely for shelter and defensive purposes. 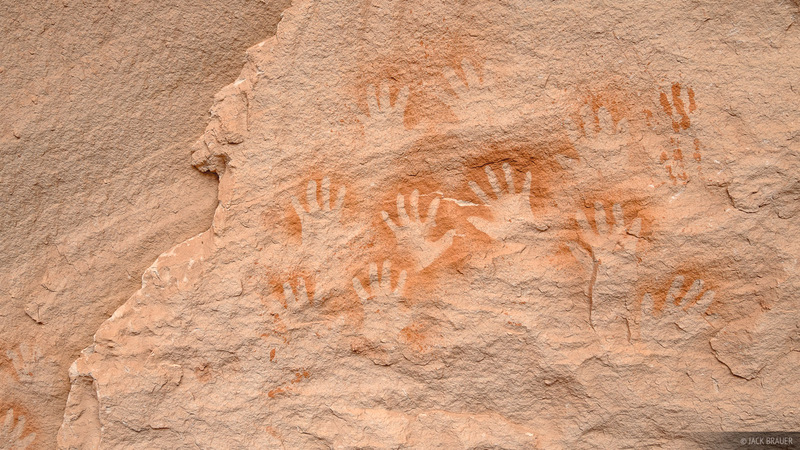 Reverse handprint pictographs on the wall of White Canyon; these were created approximately 1000-700 years ago. 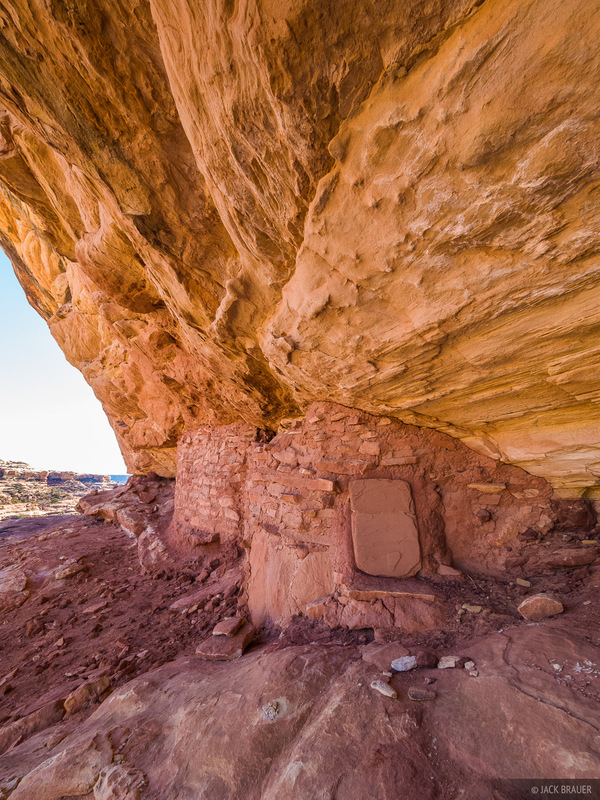 An Ancestral Puebloan kiva in White Canyon. A nasty storm approaches the Goosenecks of the San Juan River, as seen from Goosenecks State Park overlook on the southern end of Cedar Mesa in southeastern Utah. Moments later the rain started falling for the rest of the evening. 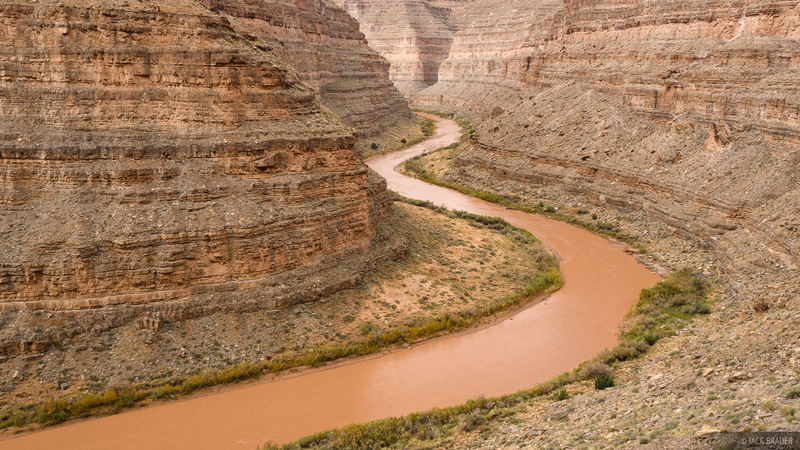 The San Juan River, which originates from the San Juan Mountains of southwest Colorado, slowly flows through the 1000 foot deep canyon walls, forming one of the world’s best examples of entrenched river meanders. This is one river in the photo – it flows from left to right via three immense meandering curves. If you look at my photo of Goosenecks State Park above, you can see that there’s absolutely no way to hike down to the San Juan River in that area — continuous cliff bands block any possible route down. However, back in the 1890s a precipitous trail was constructed nearby by Henry Honaker as a supply route for gold prospectors. Honaker’s unbelievable trail zig zags down a puzzle-like route from the rim to the river, oftentimes descending sheer cliffs via large ramps built from meticulously stacked rocks. 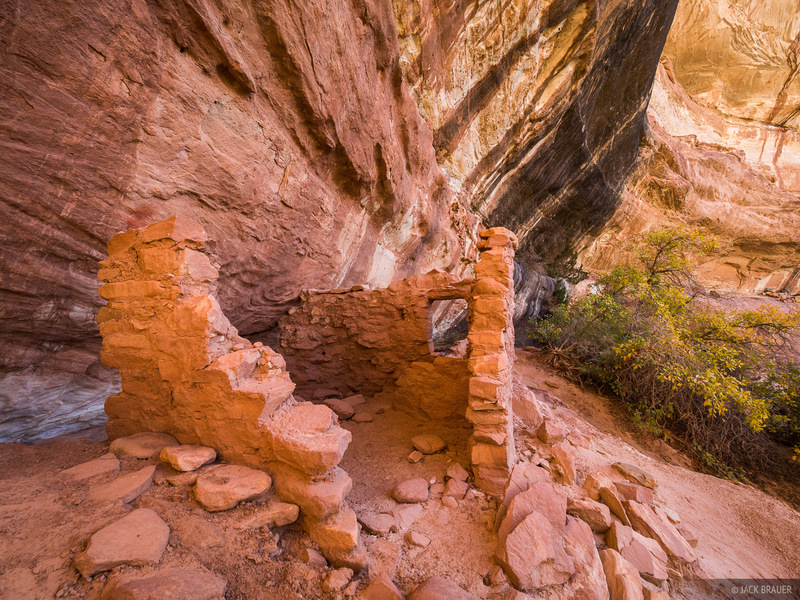 A seldom-visited ruin in a Cedar Mesa canyon, with intact door. 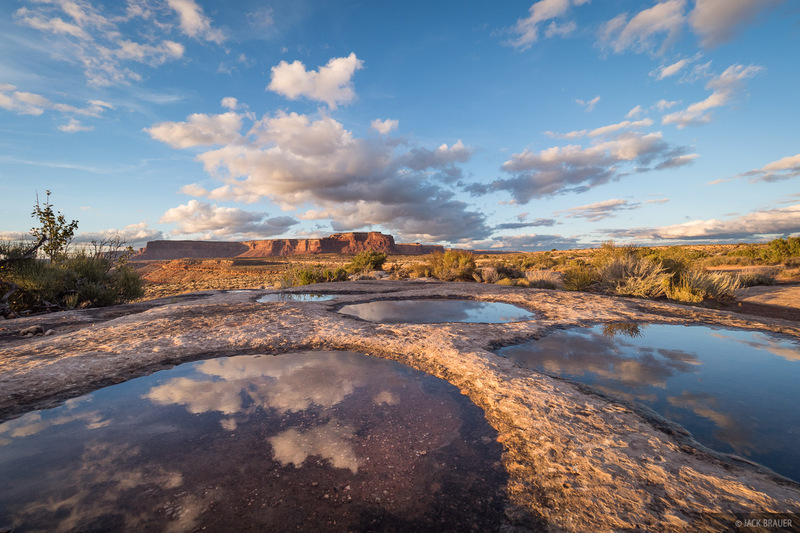 The Cedar Mesa Plateau has one of the highest concentration of Ancestral Puebloan ruins in the Four Corners, with sites scattered up and down every canyon. 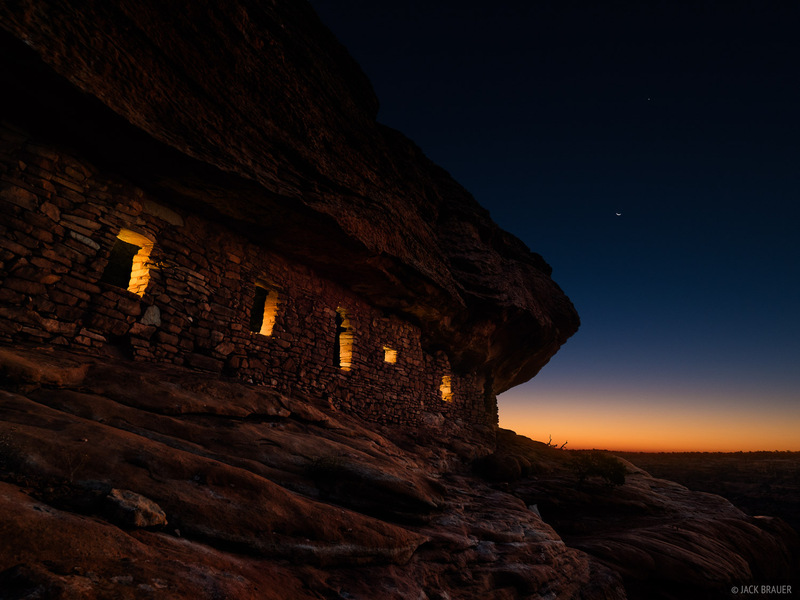 The Ancestral Puebloans (also sometimes referred to by the outdated term “Anasazi”) lived in the Four Corners region roughly one thousand years ago, though evidence of their predecessors dates all the way back to 6500 B.C. By about 1300 A.D. the region was abandoned. Most of these ruin sites are located under natural alcoves on high ledges, oftentimes with difficult access points that provided defensive protection. The Ancestral Puebloans farmed corn on the canyon floors or up on the rims, and even today you can still find little dried corn cobs in many of the ruins. Most of the pottery has been stolen by pothunters by now, but you can still find small potsherds and sharp rock blades around some of the more remote ruins. Kiva interior. *Note that I did not enter this ruin; I shot this photo through a window. Dawn at some high perched ruins. *Please note that I did not enter or disturb these well-preserved ruins; the internal lighting effect was from a flashlight that I carefully placed on the window sills. 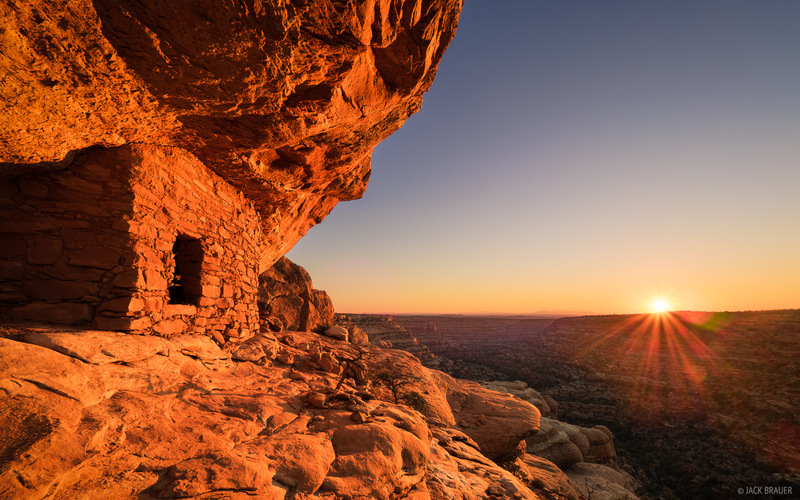 Sunrise light illuminates a ruin perched on a high ledge. I don't think I've ever seen a ruin with such an expansive view! The famous "House of Fire" ruin in Road Canyon. The bridge orange color is from an intense "bounce light" reflecting from the sun-bathed surrounding sandstone. 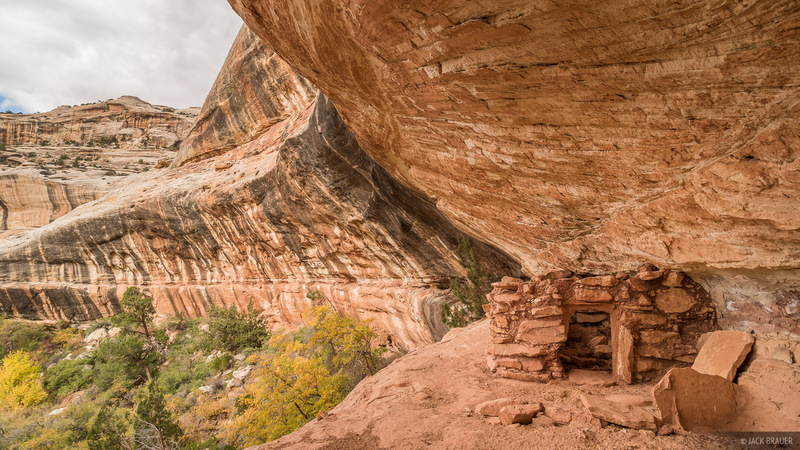 Posted in Canyons & Deserts and tagged Utah, Green River, Capitol Reef, Bears Ears, Natural Bridges, Cedar Mesa.